The names have changed, but once again experienced mountain climbers get into trouble on Mt. Hood. Something went wrong for climbers Luke Gullberg, Katie Nolan and Antony Vietti. 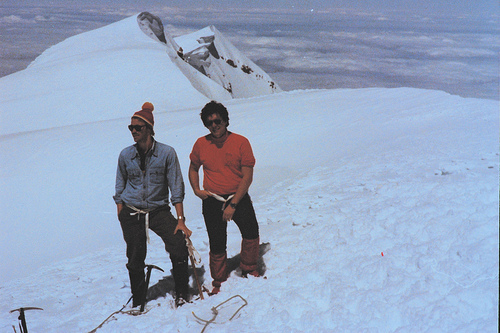 This past Saturday, rescuers found Gullberg’s body and retrieved a digital camera that recorded the group at 10,000 feet on the Reid Headwall, the steep rocky face that rises above Reid Glacier. This part of the mountain is complex and best climbed in May-June under cold conditions. Rescuers are continuing to search for the other climbers. It was just three years ago, almost to the day that we learned about rescue efforts to find 3 other missing climbers (Kelly James, Brian Hall and Jerry “Nikko” Cooke), on Mt. Hood. All this made me reflect on the one-and-only time I climbed the mountain. Of course it wasn’t in the middle of December, but none-the-less it was a challenging adventure for someone with no mountaineering background. Mt. Hood is one of several volcanoes on the west coast of the U.S. It is located about fifty miles east of Portland, Oregon in the Mt. Hood National Forest near Hood River. It is very easy to reach the trailhead since it starts at the parking lot of Timberline Lodge at an elevation of 6,000 feet, which is the base for the ski runs located on Hood’s southern slopes. It is common to see skiers high up on Hood. In fact, last year/season the ski area Meadow’s broke the all-time skier/boarder attendance record with 1.83 million visits. But the mountain can also be very dangerous as noted by the deaths in May 2002 of climbers falling into a crevasse and a helicopter rescue gone bad. The nine climbers were swept into a 50-foot wide and 20-foot deep crevasse, known as the Bergschrund, early in the morning. Three of the climbers were killed and four more were critically injured. 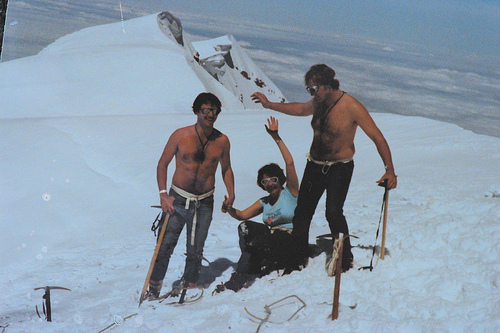 And despite being the site of one of the worst climbing disasters in the U.S. in 1986 and that in the past 100 years, there have been more than 130 deaths on Mount Hood, it is very popular for various skill levels and some 40,000 people fill out permits to climb it every year. But I’ve moved off topic. I summited Mt. Hood in May 1978 (yeah, I know that was before Al Gore “invented” the internet!) with two college buddies along with a number of other climbers who we never met before. We used the standard route named the “Hogsback“. It is a very long, but straightforward day. We climbed independently most of the time, but roped up near the summit since the final ridge is exposed, slippery and can be windy. The previous day we met up at Timberline Lodge to get final information and register with our guides from Mazama and the Park Service. We got the paperwork filled out and proceeded to an orientation as we spread all our gear on the floor for a final check and a quick refresher course on the “rest-step”, crevasse rescue and harness/rope travel. My friends and I looked at each other…”refresher”…we didn’t know about crevasses, or ropes, but we all thought the ice axe was cool. After the “lesson”, we killed a few hours in the lodge giving Heidi some love (a St. Bernard dog who has since past away) who was the lodge’s goodwill ambassador. Bruno has since replace Heidi and is doing a fine job continuing the role. We over nighted in the Chalet Rooms. These are European-style bunk rooms with shared access to a public bathroom with showers centrally located in the hallway. We had a 3am wake up call and everyone knew it would be difficult to sleep. The “snorer’s” seem to be asleep in seconds and kept most of us from any quality shut eye in the bunks. We started the climb at 4:00am after a big bowl of oatmeal from the cafe. The route was clearly marked (by our flashlights) with a big sign stating “Climber’s Route” as well as discs on tall poles. This route takes climbers along the east side of the ski runs. The starting elevation is about 6,000 feet. The steady slope rises two miles to the top of the ski runs (oh how we wished for a chair ride on Palmer!) at a 30 degree grade. You are cold for the first 30 minutes then the steady grade gets the blood flowing in the legs and you begin to peel off layers. As my eyes adjusted to the darkness, I was surprised to see so many other people climbing on this foggy morning. There was no wind, but the heavy fog made it cold anytime you took a rest. As the sun came up we were treated to the burn off of fog and the shadow of Hood off to the west. I was a little slower than my friends, but I plodded along…step-rest-step-rest. We took a longer rest at the base of the Hogsback about 10,000′. 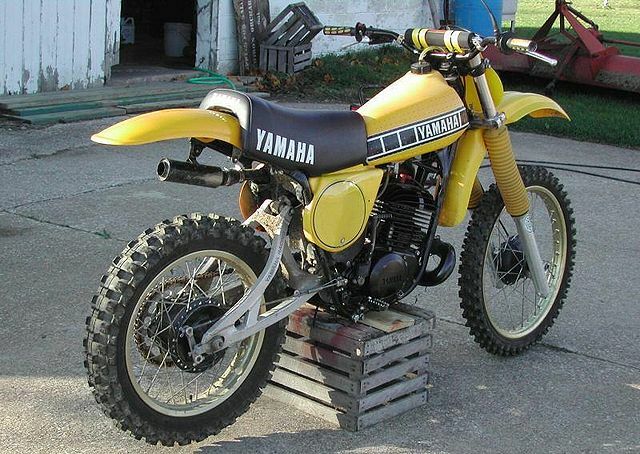 I remember the strong smell of rotten “eggs”…sulfur…I expect from the out-gassing of the mountain. Looking up at the ridge, it was clear as we needed to rope up for safety otherwise it would be a quick slide down the mountain! So, on with the harnesses as I latched onto the rope. On top! It was about 11:00am and it had taken seven hours to climb the 5400′. Everyone enjoyed the views and took pictures as well as made a quick climb to the true summit about a hundred feet away and maybe 50′ vertical. On the downclimb, we roped up again until we were at the bottom of the Hogsback. From there it was a simple matter of tracing our steps back to the parking lot. With the steep slopes, we enjoyed some glissading in the black trash bags we packed and that sped things up quite a bit. It took us about 3 hours to return. I think Mt. Hood is more challenging than advertised, especially if the weather is poor. The route is straightforward as long as you use Crater Rock as a guiding landmark. The crevasses are grouped off the primary route but climbers have been known to “find” them during whiteouts or storms. As I reflect I remember it was a quiet May afternoon and my body was absorbing the warmth from the midday sun. In fact, it was too much sun. As we down climbed Hogsback a lot of people coming up were covered in Zinc Oxide? Later, as I unbuckled my harness in the parking lot and felt the stiffness in my body…in particular my sunburnt face. I’ve never forget this positive experience with good friends. I hope only the best for the 2 remaining climbers. UPDATE: December 21, 2009 — sadly the Mt. Hood rescue/search was called off last week. 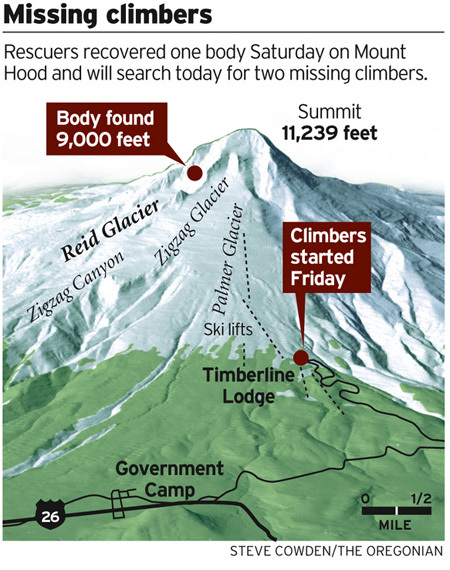 The remaining two climbers (Nolan and Vietti) presumably dead were left behind to be found another day. Speculation of what happen was pieced together from clues found on Gullberg’s body. Cell phone photos seem to indicate there was an accident along the way and that Nolan may have been injured. 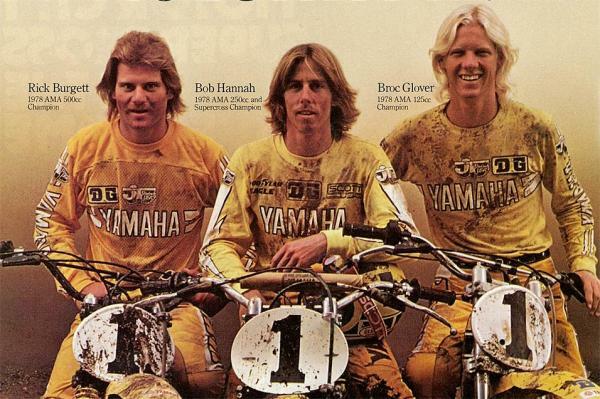 Vietti stayed behind with Nolan and Gullberg elected to climb down the mountain, but fell on his descent suffering some minor injuries, but then died of exposure. These deaths, like the many before them spawned another debate about people risking their lives climbing the mountain in the middle of winter. There has been a barrage of comments on the climbing “boards” about the use of transponders and an ‘entitlement’ factor that such devices might provoke. It’s a complex issue. I know that many if not all the rescuers who are involved in this line of “work” get no pay and have to buy their own equipment as well as supply their own food and transportation. They are hero’s in my book! To the climbers who perished… may you rest in peace and let’s keep the families of the climbers in our thoughts. UPDATE: August 28, 2010 — Anthony Vietti and his climbing companion, Katie Nolan were found and recovered yesterday. The bodies were found at the 9,700-level of Reid Headwall and it appeared that the two climbers had fallen down a steep slope. Climbers at the scene yesterday said the two were still roped together and located only about two feet apart. Map photo courtesy of Steve Cowden/The Oregonian.